Add widget in your menu content (Pro version). 6 animations: shift-up, shift-down, shift-left, shift-right, fade, flip. Custom mega menu content width. 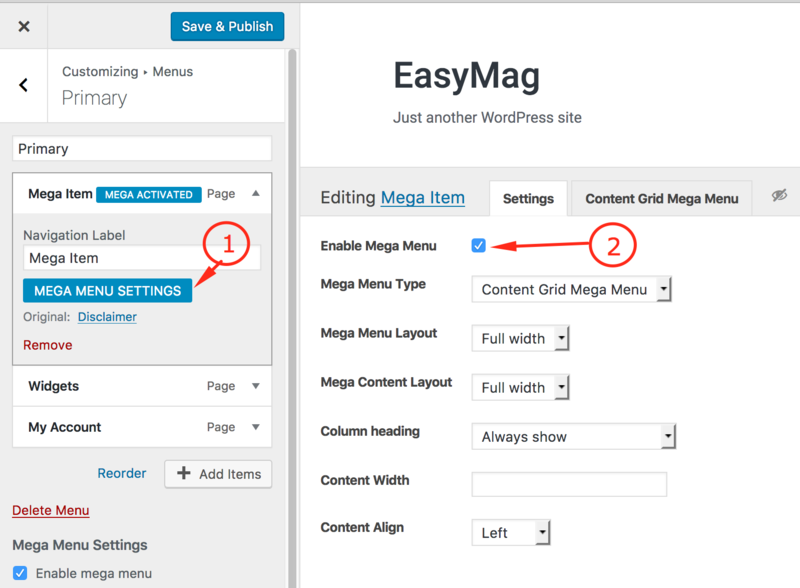 Just go to Plugin -> Add new then search with keyword "EasyMega" then hit Install Now button. See more detail about WordPress Plugin Installation here. 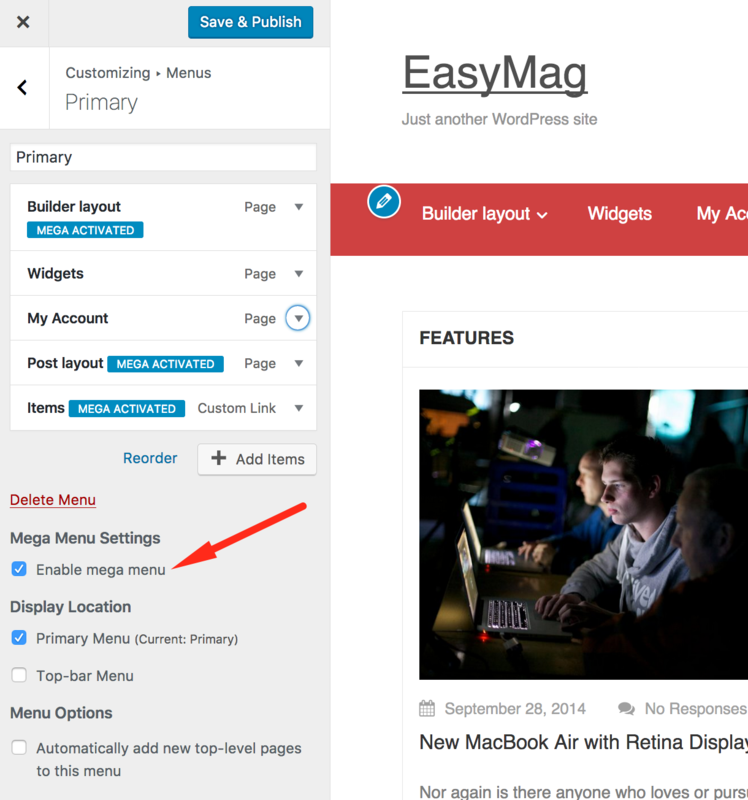 Navigate to: Customize -> Menus -> Select a menu if exists, if not, Just add new, scroll down bottom and check to "Enable mega menu". Example i have defined menu Primary. After Mega menu enabled you can see Mega menu settings button for each menu item. Click to Enable mega menu new panel will open. Check to option Enable Mega Menu to enable mega menu for this item. Toggle enable disable menu for current item. 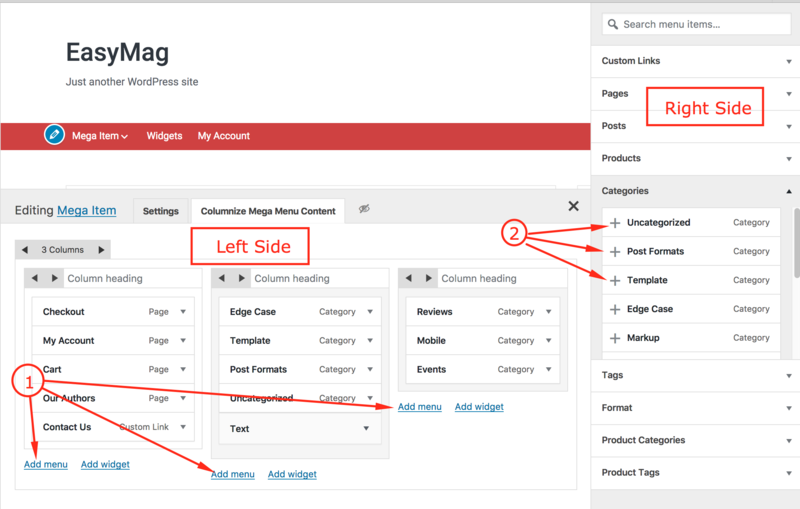 Switch between mega content types Columnize Mega Menu and Content Grid Mega Menu. Columnize Mega Menu: use simple mega content builder to add content. 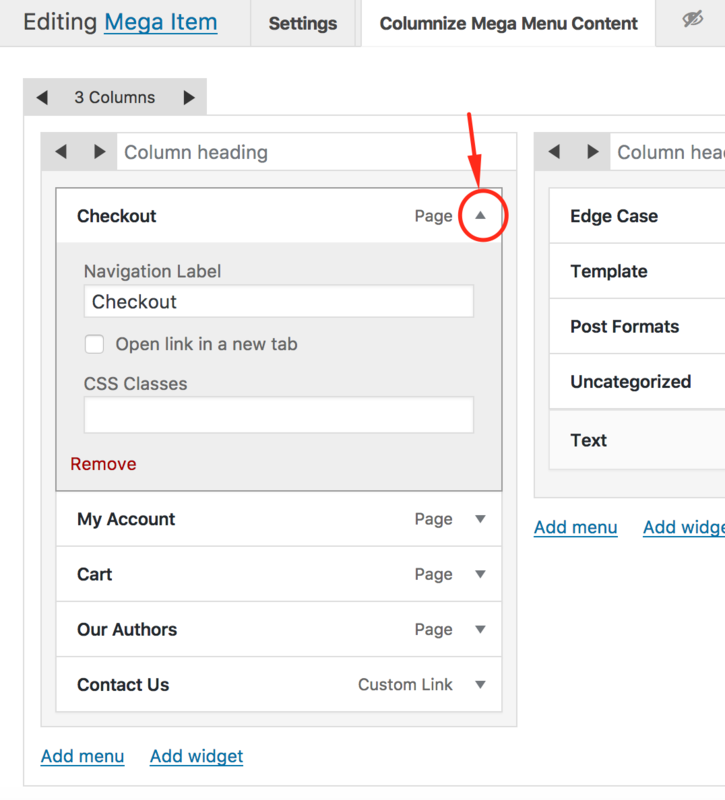 Columnize Mega Menu: Use posts type for defined layout content. Select layout for menu layout, it can be Full width or Boxed. Full with: Mega layout will width 100% of your browsers. Boxed: Based on main layout of your site. If you Mega Menu Layout is full with you may need set content layout to boxed and full with. Full with: Mega content will width 100% of your Mega Menu Layout. You can set Mega Menu Layout full width and Mega Content Layout to boxed to see difference. This option use for Menu type Columnize Mega Menu. Maybe you need add more heading for you menu columns and you want to display them on mobile only, this option will helpful for you. Set custom width (a number), If you don't want to use full width or boxed layout this option will help you do that. 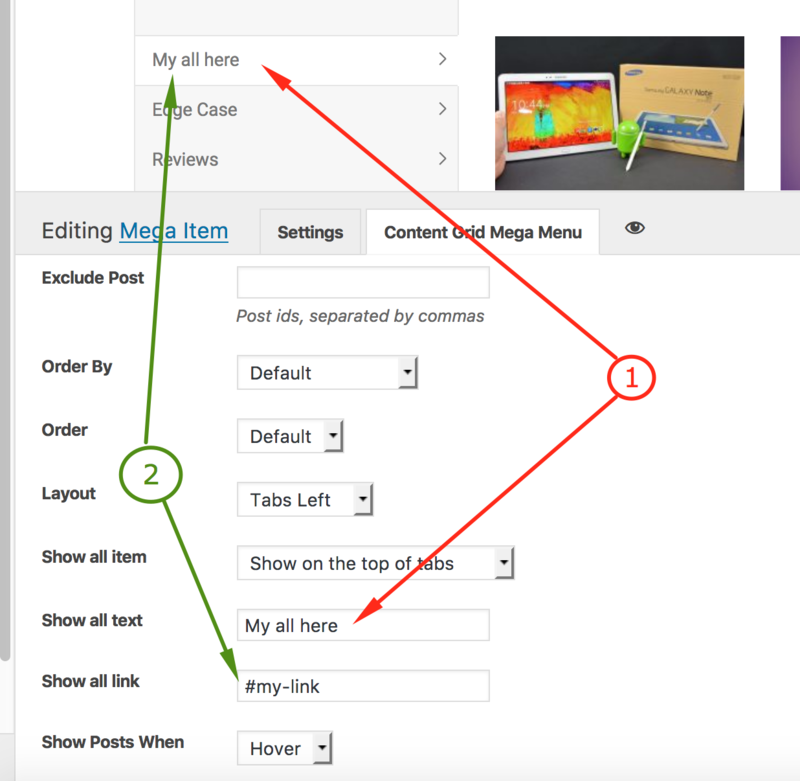 When you use custom Content Width you will need set align for you mega, just set it here. Available aligns: center, left, right. When you select Mega Menu Type as Columnize Mega Menu, you will see Columnize Mega Menu tab next Settings tab. Support up to 4 columns. Click to left arrow to remove column, Click to right arrow to add more column. Click to arrow to resize current column. Type something for column heading if you want. Add Menu Item to content area. Click to this link to add menu items. Add widget to column content area. Click here to add widget (Available for Pro version only). Adding an menu item to column. Click to Add menu link to add more item to current column. Click to any items on Right Side to add menu items (Just like add more menu items on menu customize). Click to Left Side to close Right Side. Editing, Remove an menu item. Click to arrow button to explain settings of item, let change what you want. Click to remove link to remove item. When you select Mega Menu Type as Content Grid Mega Menu, you will see Content Grid Mega Menu tab next Settings tab. You can select any post type here, On free version you can select source as post only. 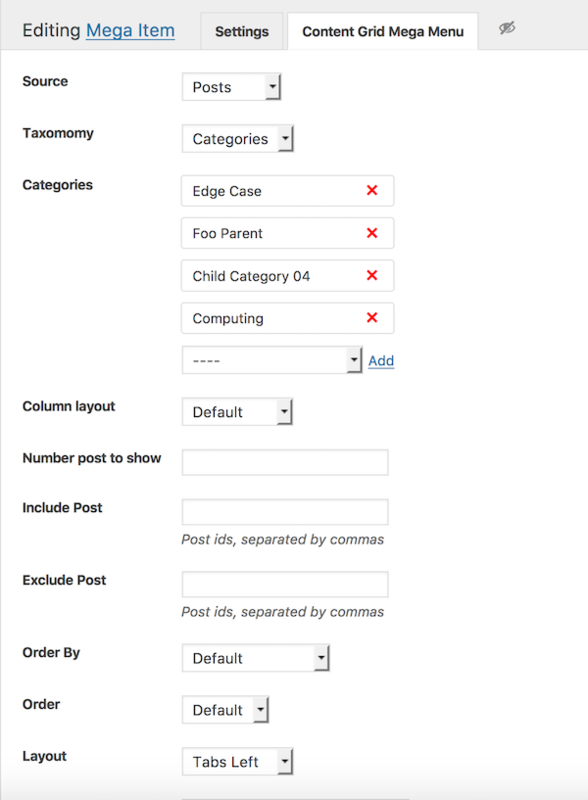 Each source (post type) have own taxonomies, example post we have Categories, Tags, Format, ... Just select taxonomy you want. Each taxonomy you will have own terms, example post we have categories example: Fashion, Music, Film,...Just select terms for post type display, Drag added items to sort. By default 2 terms allowed, Upgrade to Pro to add unlimited items. Number post per row to display, you can select 2,3,4 or 6 columns to display. How many posts you want to display. Use post ids. Specify posts to retrieve. ATTENTION If you use sticky posts, they will be included (prepended!) in the posts you retrieve whether you want it or not. Separated by commas(,). Use post ids. Specify post NOT to retrieve. If this is used in the same query as include post, it will be ignored. Separated by commas(,). Sort retrieved posts by parameter, available: title, date,rand, comment count, post included. Designates the ascending or descending order of the 'order by' parameter. Layout to display, available: tab lefts, tabs right, no tabs. Add show all item link to tabs layout, You can select add this item on the top or at the bottom of tabs. Show posts when you hover or click on the tabs. If you want to use your custom css file just check this. 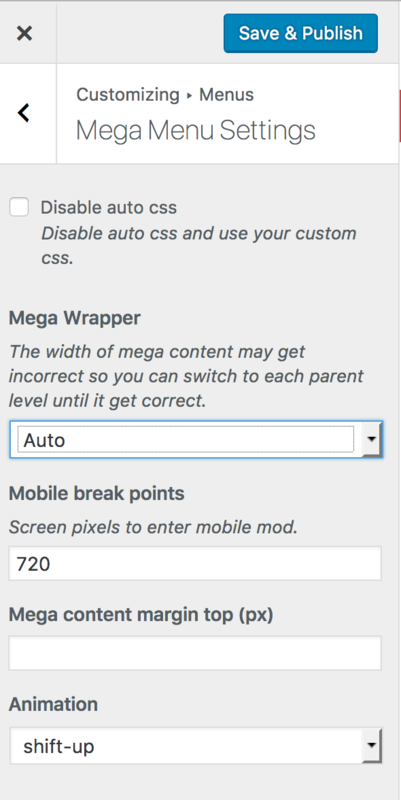 The width of mega content may get incorrect so you can switch to each parent level until it get correct. Each theme have different break points, which enter your site into layout tablet, mobile mod. You can find break point by using responsive testing tools. If your mega content margin top incorrect you can reset it here. Select animation for mega content when display.